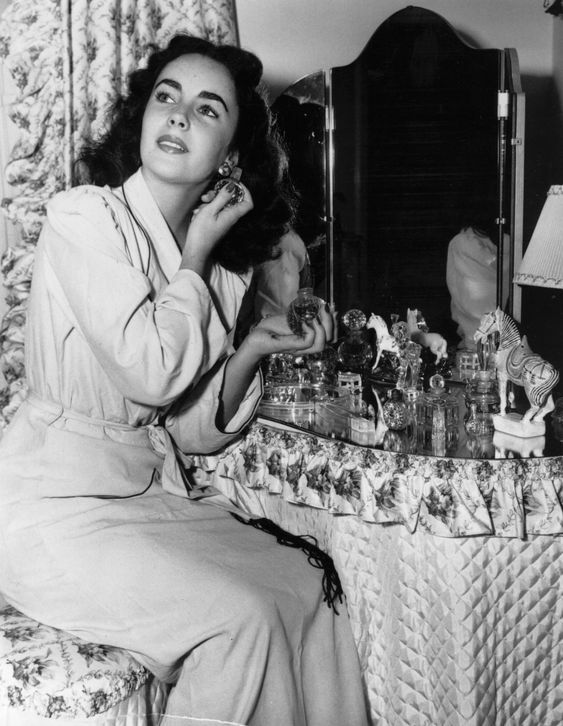 But I did use to keep a perfume tray out for the sake of convenience, and it displayed some of my most-worn scents. Sadly, after several years of sitting in indirect sunlight, the top notes have turned in my bottles of Burberry Brit EDT, Tracy by Ellen Tracy, Clinique Happy, and Calvin Klein Truth—at least the scents are fine once I get past the first couple of minutes of soured top notes. Britney Spears Fantasy fared well, but I think it’s because the bottle is semi-opaque. (You can tell I wasn’t keen on using more expensive or discontinued scents as guinea pigs!) Overall, my first attempt at a perfume tray didn’t work as well as I would have liked. Recently, I decided that I needed to compromise: I’d set out a perfume tray, curated once a month so that no one scent gets left out of its box for too long (except for the most worn ones), and most importantly, instead of leaving it out in the light like I did last time, I’d leave the tray in my closet area, where it is normally dark. My closet’s light is also mostly generated from light bulbs and not the sun—I’m guessing that UV rays are more damaging. The temperature is also quite steady in there. How come editorial photos never have fun, cheap fragrances displayed? It’s always Chanel, Jo Malone, Guerlain, Byredo, Tocca. Boooring! However, a mini-accident that transpired today is making me rethink that plan. I was moving my tart dish to my desk for photography when a statuesque Serge Lutens bottle toppled over! Thank goodness I only dropped it a few inches and it landed on something soft. And, frankly, with fifteen bottles on the dish, it was already getting a little heavy. I don’t know that I could safely handle more bottles on a larger and taller tray! I might have to stick with a one-storey tray option. 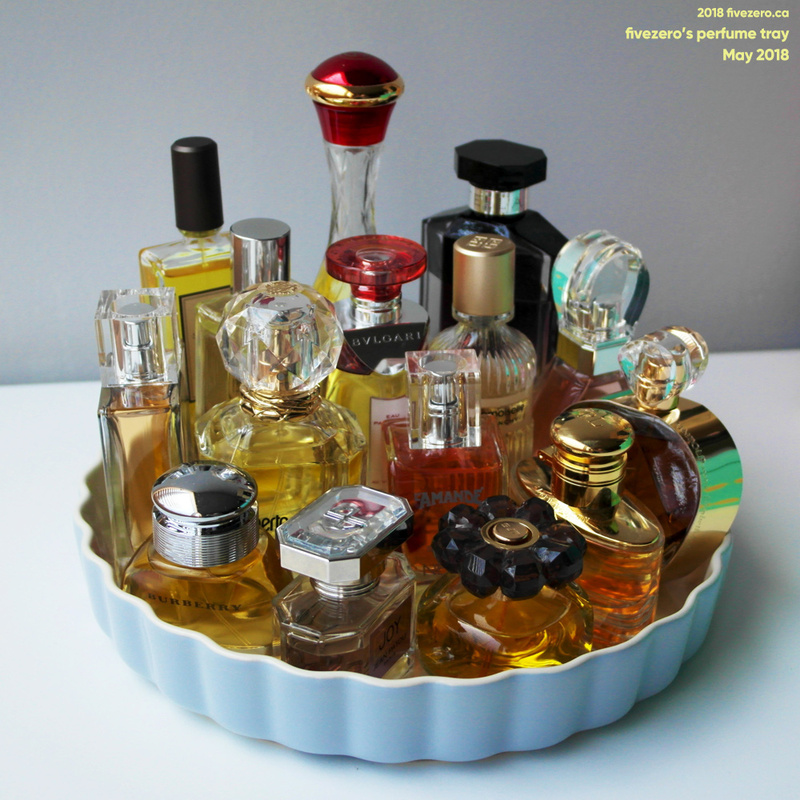 Anyway, I have assembled my perfume tray for May. Our weather in April has been horrendous: it’s like spring never began! May is looking warmer, though we have some thunderstorms coming up, too. 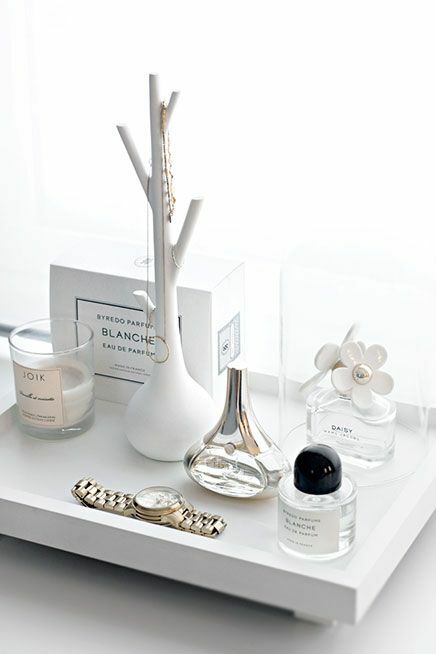 My perfume selection is, therefore, a mix of cool and warm weather favorites. I will not be sticking by this tray selection exclusively, as some perfumes were never in contention for the tray (I have them well-stored elsewhere, or they’re too large and awkward for the tray) and I’m typically keen to try any new additions to my collection. Plus, I have plenty of perfume samples to go through. Yet, I’ll aim to wear the selected perfumes as much as possible, since I am hoping that the easy access will encourage me to use more perfume than I normally would. I’m little bit embarrassed that most of the bottles I’ve chosen are very full, but that can partly be explained by the fact that more than half of the bottles are newer additions, I am generally a light sprayer, and I spent the last several years barely wearing any perfume at all. It’ll be interesting to see perfume levels in my bottles by the end of the year. Also, for a bit of fun, I will update my perfume diary here throughout the month of May. They are so incredibly delicious! Let me know if you try any. I really do want to experience more but for now, I have only one! 413,287 times by nail polish fans!